I wouldn’t say T. is extremely fussy. He does eat a wide variety of foods, loves his fruit and will try new foods (even though 99% of the time the reaction is YUCK!). But, like many parents, we do have our challenges in trying to get him to eat the right things. These are just a few ideas that I try to live by. They are just a guide as to what works in our house. 1. 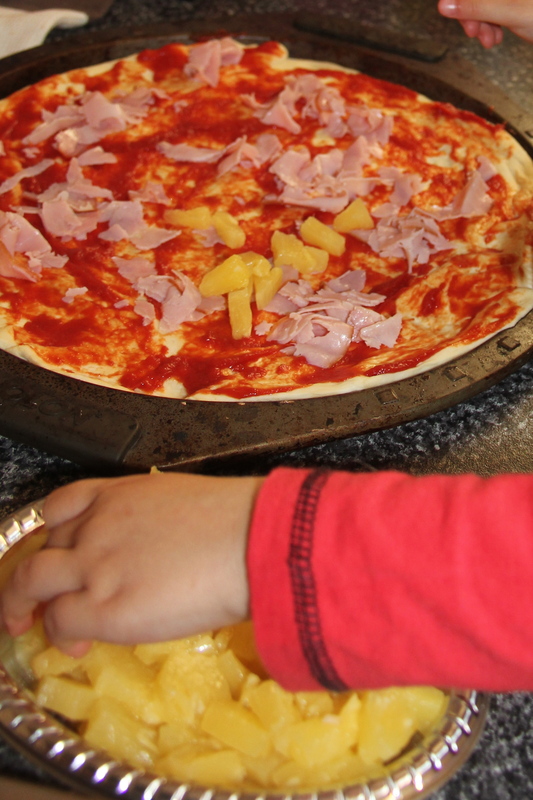 The most obvious – Cook with your child. Introduce them to new ingredients as you are cooking. 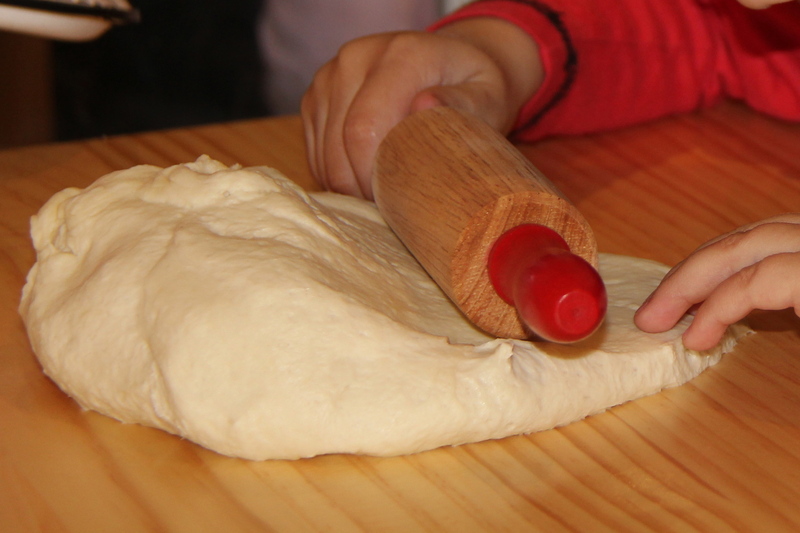 Children are much more likely to eat something that they have helped prepare. Not to mention the self esteem boost that comes from watching others consume the foods they have cooked. 2. Make the most of every mouthful – ultimately you have the control over what goes into your (young) child’s mouth. Where you can, add grated veges to dinners, cook fruit muffins instead of chocolate ones, make savoury muffins for lunches and afternoon snacks. 3. 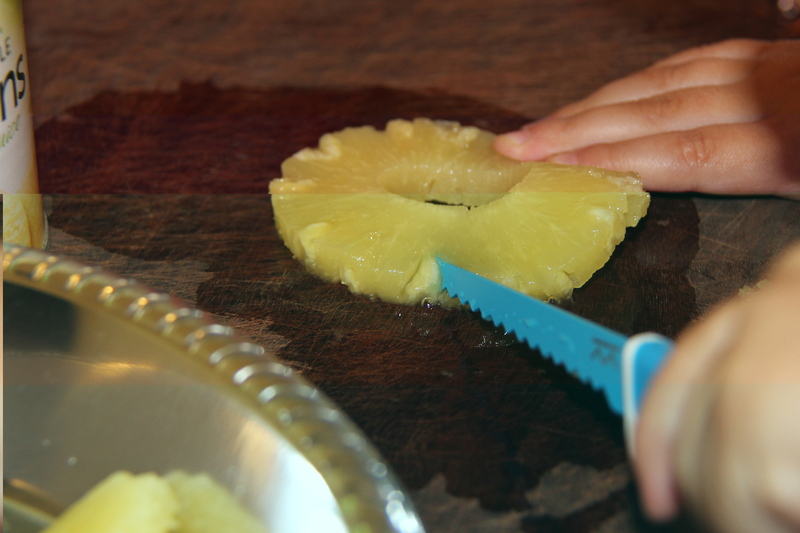 Place small amounts of new foods on your child’s plate along with foods they are familiar with and enjoy. Encourage them to just taste the food. 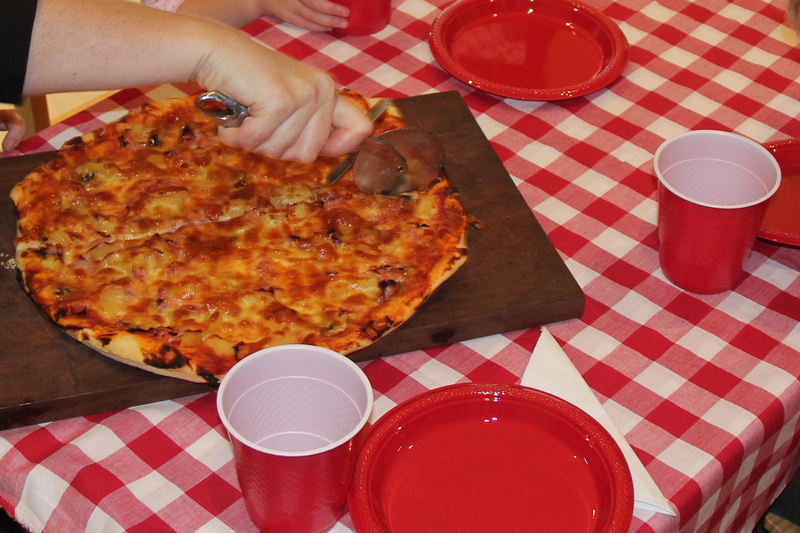 Try not to pressure them to eat the whole lot – a taste is a success! 4. Children need to be offered a new food at least 10 times before their palate begins to enjoy it so don’t give up. Keep offering them the foods and encouraging just a taste. 5. Give choices – offer a choice of 2 new foods so you child has some control over what they are eating eg a piece of broccoli and a piece of tomato on the plate – ask them which they would like to try and take the other away. 6. Use a reward system / star chart for trying new foods. Choose a reward that isn’t food related like going to the park or playing a favourite game. 7. Be a good role model and make healthy food choices yourself. 8. Eat meals together as a family so your children see you eating the same food as them. 10. Take the pressure off – both yourself and your child. Don’t make mealtimes a battleground. 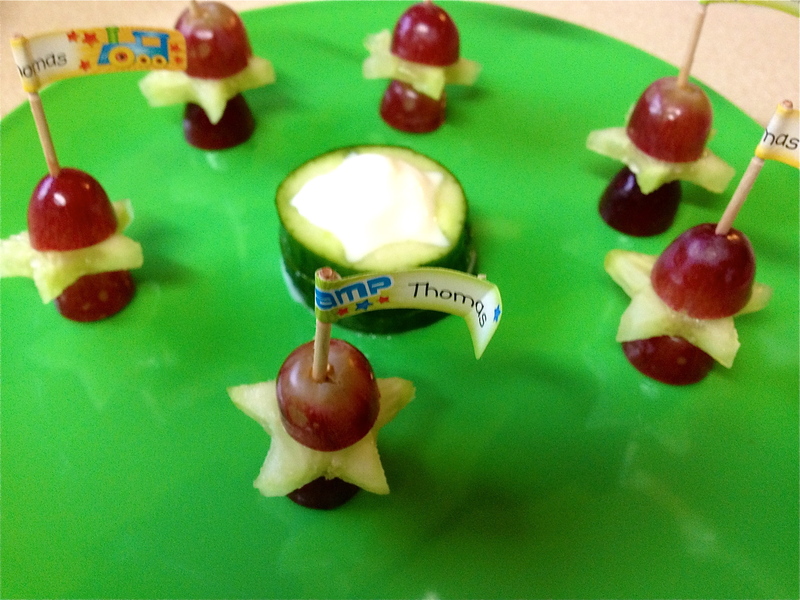 Thomas has always loved his fruit. I’ve never had any trouble getting him to eat it. Vegetables on the other hand have become quite an issue. He has started to become hungry and asking for food at around 5pm (we eat at 6). I was happy for him to have some fruit at this time until I realised that he was having about 4 servings of fruit a day – not that there’s anything wrong with this but I decided if he was really hungry at this time then I would offer him some vegetables to eat. This wouldn’t interfere with his dinner (as he was eating vegies anyway) and also was a way of introducing some new foods. We did have some success with cucumber a while ago and teamed with a favourite fruit, this was a real success. 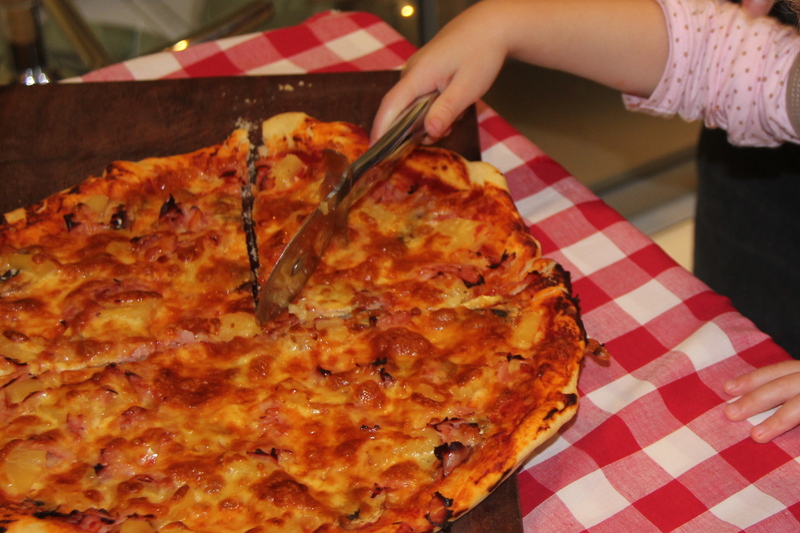 When trying to get children to try new foods, I always find it helpful to offer something they are familiar with on the plate as well, that way it’s not quite as daunting. 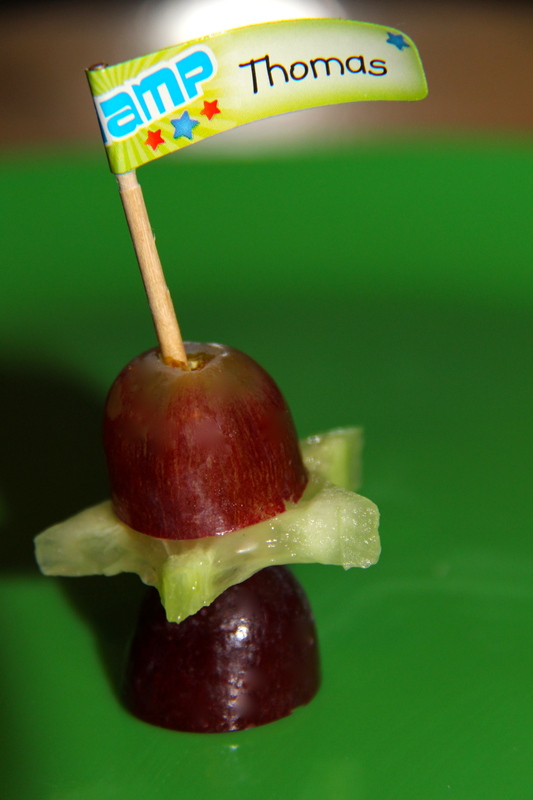 To make these grape and cucumber wands, I cut some star shapes out of cucumber slices and cut each grape in half. To the toothpicks I added some ‘Thomas’ stickers. I stacked about 3 slices of the leftover cucumber in the middle of the plate and filled the star cut out in the cucumber slices with some natural yoghurt (this didn’t get eaten but it was there as an option). It is a little bit of trouble to go to but if it gets some extra vegetables into your kids then I’m happy to spend the extra couple of minutes! I was cooking these meatballs for dinner to have with a tomato sauce and spaghetti and I thought they would make quite a good lunch time food just by themselves. Your little cook can help you mix all the ingredients together and then roll them into balls (Thomas still isn’t that good at getting his hands dirty so he’s only up to the mixing stage – using a utensil). 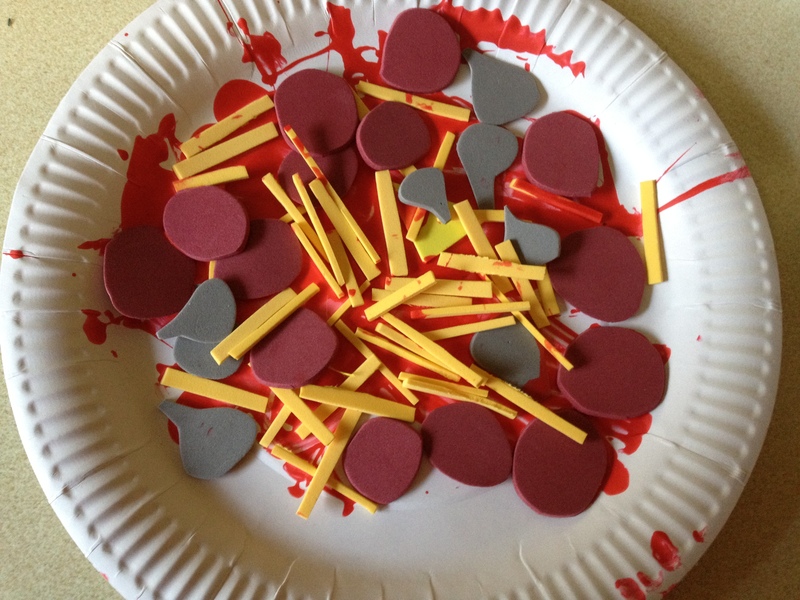 Great for helping fine motor skills, bi-lateral co ordination and sensory awareness. Line a baking tray with non-stick baking paper. Combine the veal and pork mince, onion, breadcrumbs, zucchini, carrot garlic and egg in a large bowl. Season with salt and pepper (optional). Use your hands to mix until combined. Roll 1 heaped tablespoonful of mince mixture into a ball and place on prepared tray. Repeat with the remaining mince mixture. Heat one-third of the oil in a non-stick frying pan over medium heat. Add one-half of the meatballs and cook, turning, for 8 minutes or until golden brown and cooked through. Transfer to a plate. Repeat, with next batch, with the remaining oil and meatballs, reheating pan between batches. 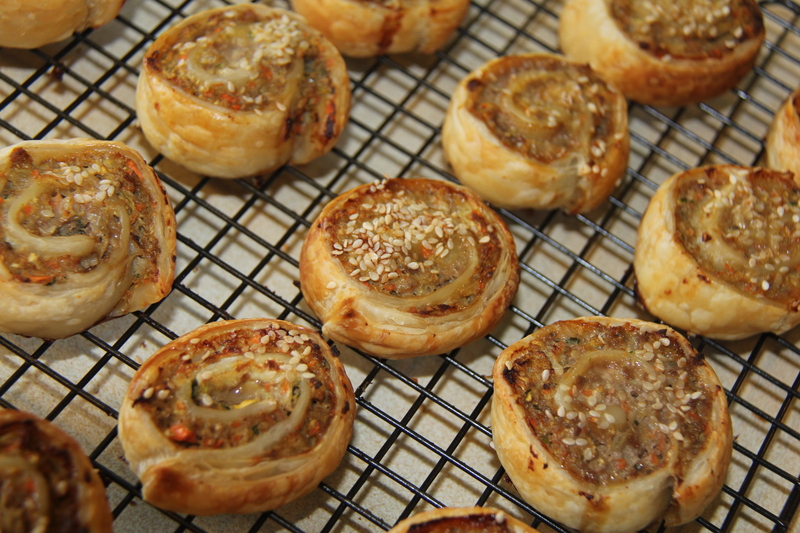 You could make a big batch of these too and freeze them in individual portions to make life a little easier :-). I am always looking for healthy options for dinner and these sounded great – and they are! I found this recipe in Julie Maree Wood and Antonia Kidman’s book ‘Feeding Fussy Kids’. The whole family enjoys it when we make these! 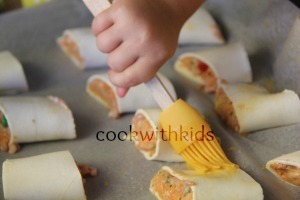 Children can easily help making these although the cooking of them might be best left up to the adults. Thomas enjoys helping crush the cornflakes when we make these. They make a great sound! We use a potato masher to do this. He isn’t quite up to rolling the nuggets into a nugget shape – needs a bit more practice with playdough but he does help me coat them. This is what the recipe calls for but I usually double it to feed the whole family. Combine the chicken, egg, sesame seeds, flour and 1/4 cup crushed cornflakes (add here carrot and broccoli if using). 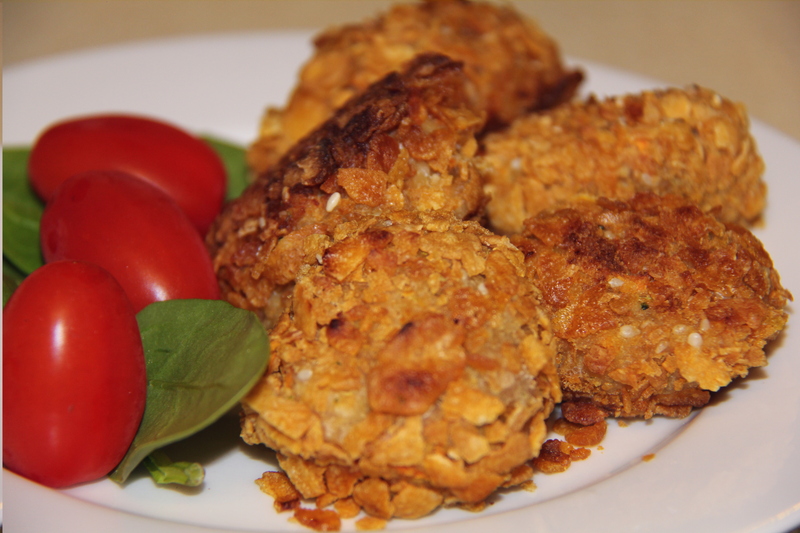 Roll the chicken mince into small nugget shapes and coat with the remainder of the crushed cornflakes. Refrigerate the crumbed nuggets for 15 minutes to allow them to become firm. Heat the oil in a non stick pan and cook the nuggets over medium heat for about 5 minutes, turning once, or until golden brown and cooked through. To freeze place uncooked nuggets, wrapped in groups of 3 or 4 into an airtight snaplock bag. Will keep frozen for up to 3 months. I recently bought a new cookbook called ‘Feeding Fussy Kids’ written by Antonia Kidman and Julie Maree Wood. There are a lot of great recipes in this book. What I love about it is that they talk about “making every mouthful count”. This is something that I really try and do with Thomas. Obviously he has sweets and treats and we don’t do it all the time but where I can I try to pack his foods with vegetables and fruits and err on the side of healthy rather than lots of processed foods high in sugar and salt. I try to cook lots of homemade meals and snacks so I know exactly what goes into them and I use lots of fresh ingredients. I know life is busy and often its a lot quicker and easier to grab some convenience food which is why I do use the freezer a lot. When I saw these little cakes I thought they were fantastic and a must try. Thomas loves chocolate and cakes (who doesn’t!) and this afternoon when I asked him if he’d like to make some chocolate cupcakes he said “is it exciting Mummy?” – meaning he was excited :-). He stayed and helped me the whole time, measuring out ingredients and mixing. He is getting very good at cracking eggs now and barely needs my help (I just have to watch that the shell doesn’t go in). 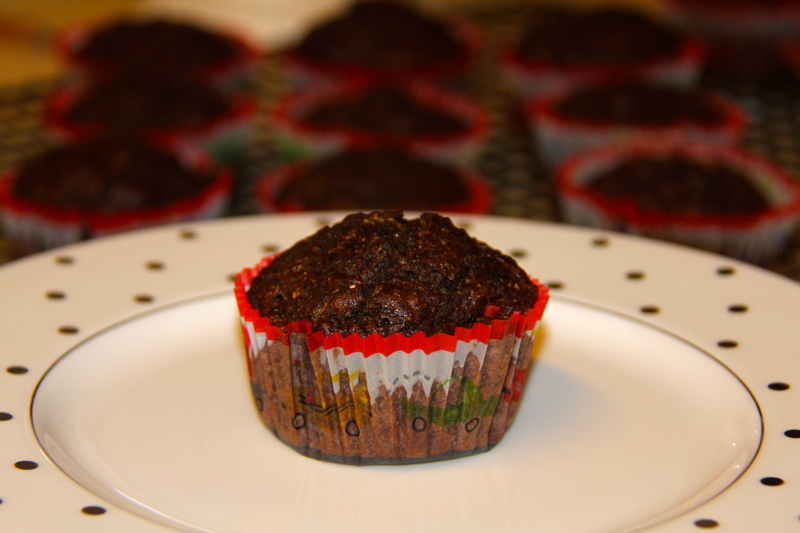 These cakes have a cup and a half of green vegetables and have lots of fibre and no saturated fat, not to mention they are chocolate cupcakes… Win-win if you ask me! Whisk the eggs, oil and sugar together in a large bowl. Add the vegetables, flours, cocoa, baking powder and milk and mix well. Spoon into the prepared times and bake for 15-20 minutes or until springy to a gentle touch. Lift out onto a wire rack and cool. You can make a thin glaze with water, icing sugar and cocoa powder to put on the top or eat them plain. Ok, so they sound a little bit interesting. They do actually taste quite nice. 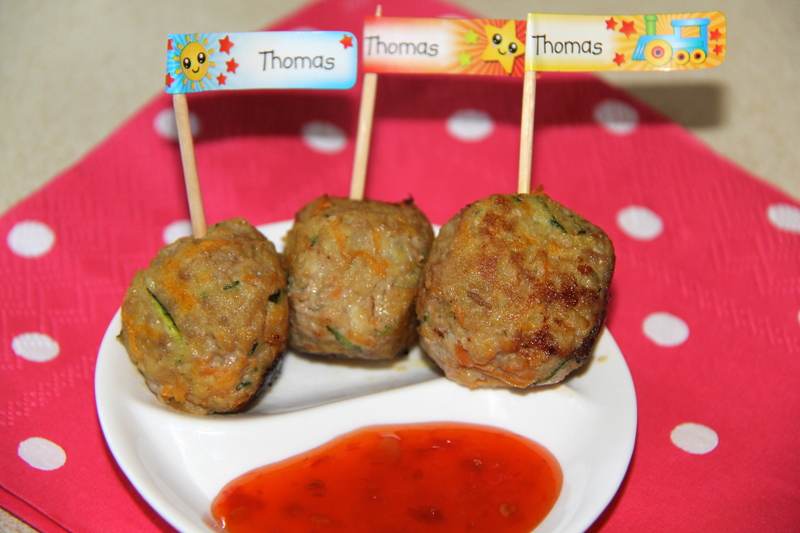 I can’t say I would crave them but you can’t really taste the vegetables in them and Thomas thought they were great. I would recommend putting the vegies in without the kids seeing though. Thomas did say to me “Tom not like zucchini” when I told him what was in the bowl :-). I remember making these pinwheels when I was in high school. No idea why I can still remember it but it has obviously left a lasting impression on me. The actual recipe is long gone. I did try to make some a while ago using a recipe I found on the internet but they weren’t the same, so I thought I would try and make up my own version based on what I can remember (with a couple of healthy additions!). It was a miserable rainy day today, a perfect day for doing some cooking with my little helper! Preheat oven to 200°C, line baking trays with baking paper. Combine mince, 1 egg (lightly beaten), breadcrumbs, carrot, zucchini, onion, chutney, curry powder and seasoning in a bowl and mix to combine. Beat remaining egg in a small bowl. 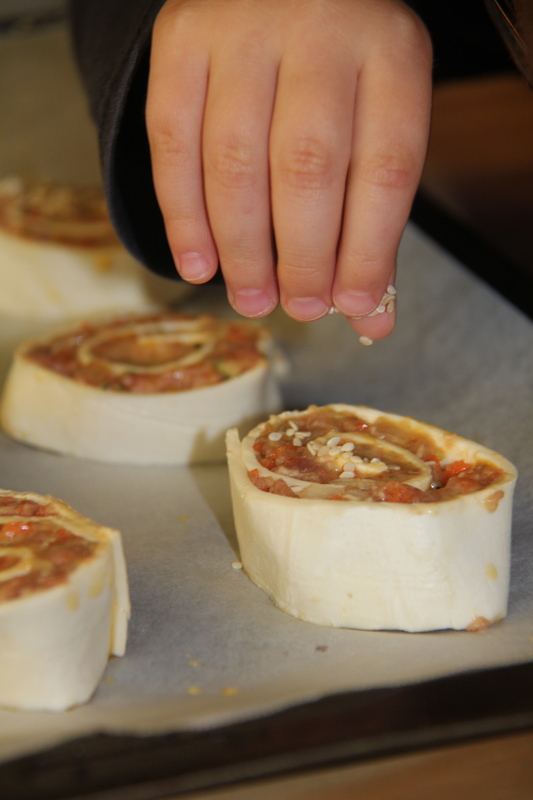 Put 1/3 of the mixture onto each sheet of the puff pastry leaving approximately 1 cm around edges. Roll up like a swiss roll. 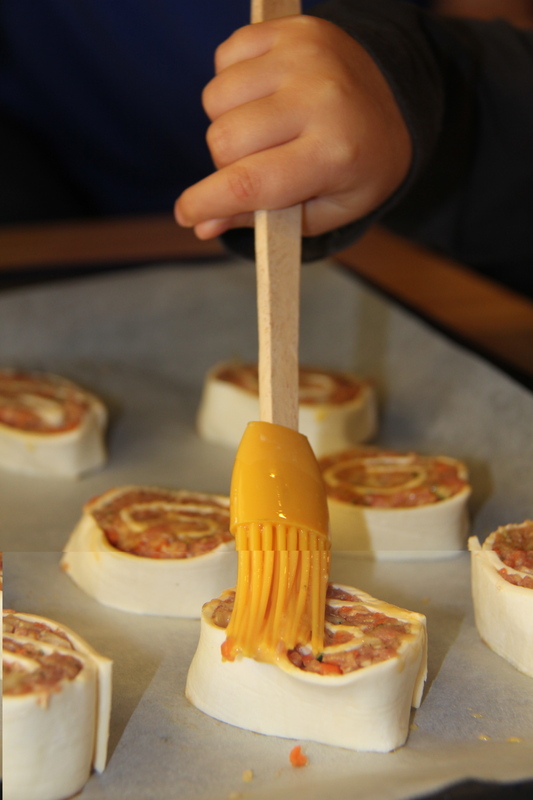 Using a serrated knife, cut rolls into 1 cm pieces and place pieces on baking trays approximately 2 cm apart. Brush with egg and sprinkle sesame seeds on top. 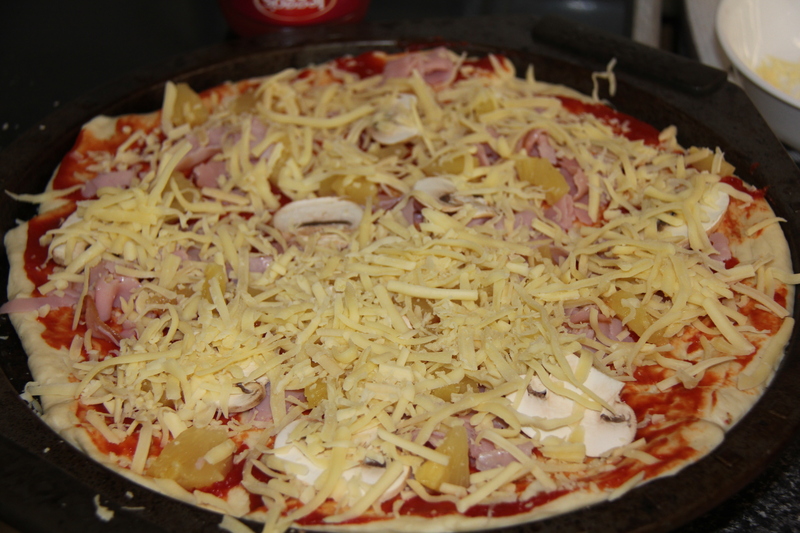 Bake in oven for 30 minutes or until golden brown and cooked through. Rest for 5 minutes then transfer to wire rack to cool. 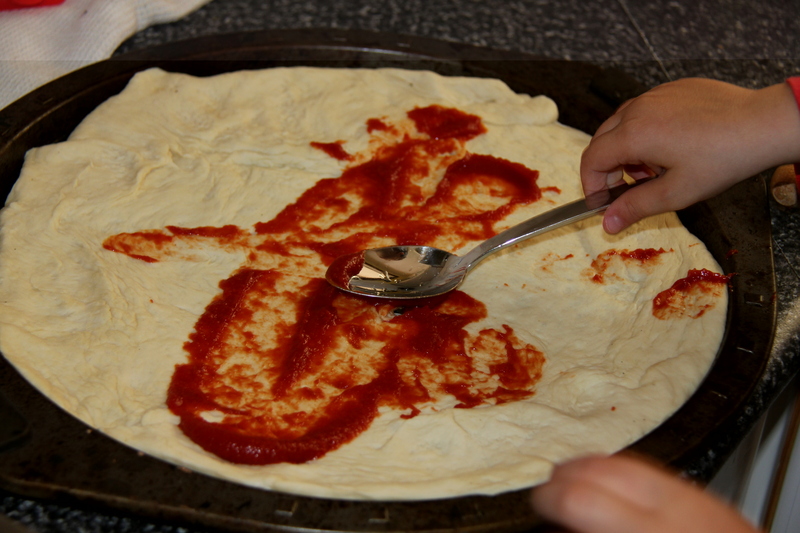 Serve warm with “dippy” sauce (tomato sauce) – optional. Note: To freeze, place rolls (unsliced and uncooked) in glad wrap and freeze for up to a month.Cut into slices when almost defrosted and brush with egg before baking. 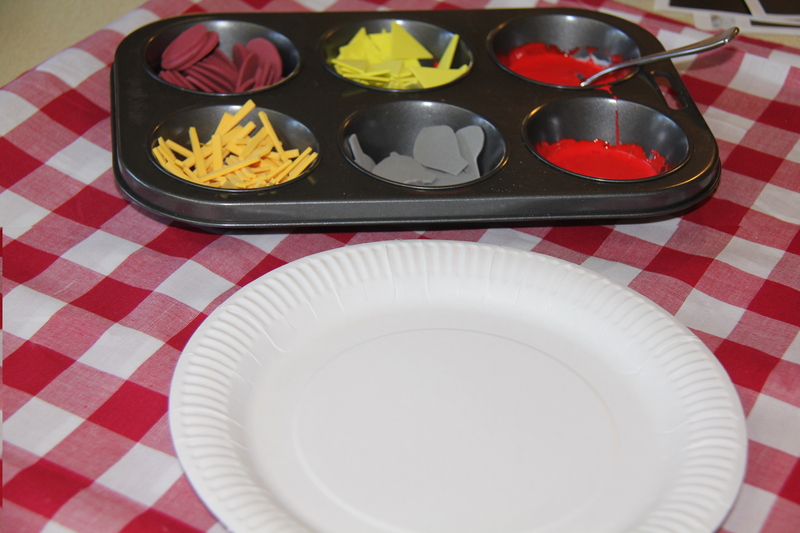 Its great for fine motor skills and hand eye co-ordination. I really only added the sesame seeds to give Thomas an extra step to help with. He’s very into sprinkles at the moment so he really enjoyed this part of the activity.